The Current Health Scenario. : In Defense of Brahmins. The Brahmin atrocities was myth created by Britishers to break the society from within and for conversion. Interesting historical facts about Brahmins. Pl read it fully. Came across this interesting analysis. 1. Indian Brahmins have been oppressing the lower caste population in India. 2. Brahmins introduced the inhuman "untouchability"
3. Brahmins are cunning, parasitic exploiters and creators of the iniquitous caste system. 4. Indian sub-continent's biggest problem was 5000 years of Brahmin oppression! 5. Brahmins never allowed others to read and write or to learn Sanskrit! 6. Brahmins are arrogant, dis-respective, communal and abusive extremists who whip the dalits (lower caste Hindus) till they die. 7. Brahmins exploited and continue to exploit everyone else. 8. Brahmins authored the Hindu scriptures just to ensure their own highest position in the social hierarchy. And any educated person believes this as 100% truth. Even those who are born in today's Brahmin caste are apologetic about their birth due to these so called "truths"! However, these 'truth' arguments clearly lack historical validity and logical consistency. It is merely a case of “repeat a lie a hundred times and it will become the truth”. (Joseph Goebbels' theory). It is amazing to see that how fiction can become truth in course of time! Let's examine truth based on facts and real history. 1. To start with, there is no SINGLE Brahmin God in Hinduism! 2. All Gods are from backward castes, dalits and tribals. 3. Brahmins never created the concept of Gods in Hinduism. 4. There was not even a SINGLE Brahmin King that ruled India. 5. To be able to oppress others requires positions of power. Brahmins were teachers, scholars, priests, advisors but not rulers. 6. 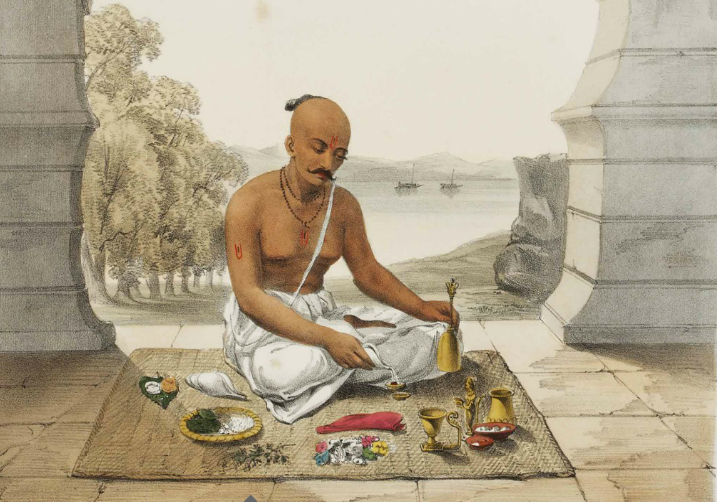 The Brahmin’s traditional occupation was that of temple priest (purohit), officiating religious functions. Their sole income was Biksha (alms) given by the land-lords (non-Brahmins). 7. And another section of Brahmins were teachers, that too without salary. 8. Vedic literature was mostly written by non-Brahmins! The most powerful of the dharma shaastra, that gives Brahmins a high status, is the Manusmriti written by Manu, a non-Brahmin. Brahmin means a profession (Varna) - not a caste. 9. If the reading and writing of Sanskrit was confined to Brahmins then how do you have the tribal Valmiki composing Ramayana? Ved Vyas, who classified four vedas and wrote Mahabharata, was born to a fisher-woman. 10. Sanskrit was used mostly by non-Brahmin writers - there are very few scriptures in Sanskrit authored by Brahmins. 11. We consider the teachings of Ved Vyas, Vashishtha, Valmiki, Krishna, Rama, Agasthya, Vishwamitra, Shrunga, Gowthama, Buddha, Mahavira, Tulsidas, Thiruvalluvar, Kabir, Vivekananda, Gandhi, Narayana guru etc as most valuable. 12. If none of them were Brahmins why cry out loudly that "Brahmins did not allow you to learn?" There are numerous works on bhakti by non-Brahmin bhakti saints. 13. Brahmins never prevented others from learning. 15. Though their profession was considered as highest stature of the society, the Brahmin ascetics' only way of survival was alms given by people. 16. The biggest contribution of Brahmins is sustaining the best language ever spoken in the earth - Sanskrit. If you learn English or Arab, you have commercial benefits. 17. Nobody ever promoted Sanskrit. Without any benefits, Brahmins took up voluntary task of learning Sanskrit. Then, now you accuse them of monopoly in Sanskrit! Besides, Brahmins were never , they were not Kings.. They didn't enjoy powers and wealth.. Naturally, they worked hard on gaining knowledge, led life of austerity.. So there is no question of exploitation by Brahmins.. When population of Brahmins range from just 2% in Tamilnadu to 12 %in Uttarakhand how can they dominate majority..
After reading all this can anyone blame Brahmins for anything ! !